Putting his qualification in Magical Herbalism to good use, the Fat Wizzard creates his own blends using pure healing essential oils as a homeopathic remedy for a range of ills or to stir the most wonderful of feelings and promote well-being of spirit. We put extensive research and testing to get the best results from our handmade remedy candles. We aim for an even burn, the right wick and don't add any nasty chemicals to enhance the scent - just the natural fragrance of the pure essential oils in each blend to ensure the most aromatherapy benefit. We do not use soy (due to it's vast negative impact on the rain forest) and we use tins which can be easily upcycled after use. As a writer at heart, the Fat Wizzard has created his own comedic fantasy world in which the candles and blends are created. Read the Scent Story associated with each blend he makes - after all there is no better cure than laughter! These make the perfect novelty gifts for family and friends, or are a great addition to your own home. Wander around his virtual village with us and visit the Fat Wizzard's Virtual Candle Shop*! 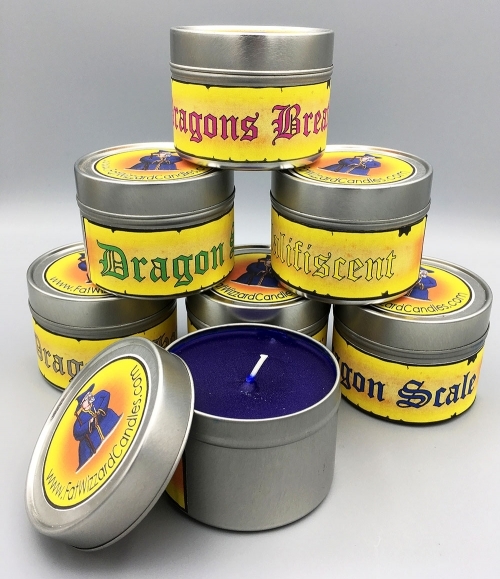 Handmade fantasy candles in a range of unique blends created by the Fat Wizzard himself for a range of homeopathic and aromatherapy benefits.